Newton, D.E. (2013). Veterinary medicine. In Gale (Ed. ), The Gale encyclopedia of public health. [Online]. Farmington: Gale. Available from: https://search.credoreference.com/content/topic/veterinary_medicine [Accessed 21 April 2019]. Newton, David E. "Veterinary Medicine." Gale Encyclopedia of Public Health, edited by Gale, 1st edition, 2013. Credo Reference, https://search.credoreference.com/content/topic/veterinary_medicine. Accessed 21 Apr. 2019. Veterinary medicine is the field of medicine that addresses the diseases, disorders, and injuries that may affect nonhuman animals. It focuses on the prevention, diagnosis, and treatment of such diseases and injuries, along with the transmission of zoonotic diseases from nonhuman animals to humans. The purpose of veterinary medicine is to provide nonhuman animals with the same type of medical care that is generally available for humans. The field of veterinary medicine is very similar to that of human medicine, with the major exception of the subject of medical care. As with the human medical profession, veterinary medicine involves the use of workers at various levels of training and expertise, including veterinary physicians (comparable to human medical physicians), veterinary technicians (comparable in many cases to human medical nurses, physicians assistants, nurse practitioners, and similar workers), and veterinary assistants, who may have little or no professional training in the field of veterinary medicine. Veterinary workers with less training than a veterinary physician are sometimes referred to as paraveterinary workers. Veterinary physicians are generally legally certified professionals who have completed undergraduate and graduate training that leads to the degree of doctor of veterinary medicine (DVM), comparable to the degree of doctor of medicine (MD) in human medicine. Veterinary technicians generally complete at least a two-year college program roughly similar to that of a practical nurse in human medicine. The typical DVM program includes courses such as introduction to veterinary medicine, veterinary anatomy and physiology, cell biology, diagnostic imaging, bacteriology and mycology, parasitology, virology, veterinary surgery, epidemiology and public health, endocrine and metabolic diseases, and diseases of farm animals and other animal groups and species. 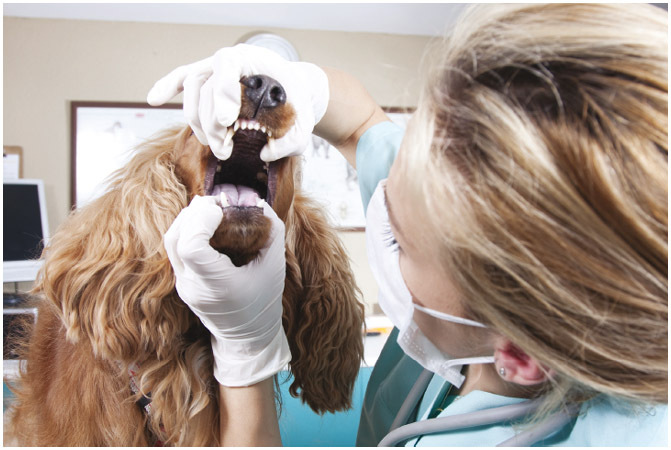 Veterinary medicine involves the care of all types of animals, including both domestic and wild species. Many veterinarians specialize in the care of special categories of animals, such as small animals (primarily domestic pets, such as dogs, cats, and birds), large animals, farm animals, or wild animals. Specializations are becoming more common also, with many veterinarians choosing to focus on areas such as dentistry, anesthesiology, cardiology, neurology, nutrition, and animal behavior. Some veterinarians have also decided to focus on the use of complementary and alternative treatment of animals, such as the use of acupuncture for the treatment of some animal diseases and injuries. The vast majority of veterinary workers are employed in neighborhood clinics, where they treat their animal clients directly. Some veterinarians are also employed in specialized assignments, however, as at race tracks, in large dairy facilities, or at zoos. Abundant evidence indicates that veterinary medicine has been practiced in one form or another from the beginning of recorded history. That is hardly surprising, given the essential role that animals have had as a means of transportation, mechanism for work, source of food, and companion of families since the earliest days of human societies. Some Chinese works of medicine dating to the second millennium B.C., for example, refer to “horse priests” who specialized in the care and treatment of large animals. Many early medical works in China and other countries also included sections on the health and medical problems of nonhuman animals, with suggestions for their treatment and prevention. One authority points out that the first descriptions of acupuncture referred to the use of this procedure on horses rather than animals, since the former were often regarded as more essential to a society than the latter. The world's first formal veterinary school is said to have been founded in Lyon, France, in 1761, and the first degree in veterinary medicine in the United States was granted by Cornell University in 1876. According to a survey by the AVMA, there were 92,547 veterinarians in the United States in 2011, divided almost equally between women (49,353) and men (43,194). In addition to general-practice veterinarians, a number of these individuals were board-certified in a variety of special fields, such as internal medicine (2,257), pathology (1,637), surgery (1,386), preventive medicine (679), radiology (408), emergency and critical care (384), ophthalmology (355), anesthesiology (194), microbiology (216), nutrition (61), behavior (52), clinical pharmacology (48), and sports medicine and rehabilitation (27). One area of growing interest among many veterinarians is the concept of One Health, which involves problems posed by zoonotic diseases, diseases that are endemic to nonhuman animals, but that are relatively easily transmitted to humans. Many public health authorities are convinced that zoonotic diseases may be the greatest public health problem among humans in the twenty-first century. Beginning in the mid-twentieth century, a group of veterinarians took the lead in developing mechanisms by which medical experts across all species lines could begin working together to develop a better understanding of the nature of zoonotic diseses, the mechanisms by which they are transmitted across species, and the ways in which veterinarians, physicians, and other health and medical specialists could work together on these issues. Developed originally by members of the veterinary profession, One Health has now become a powerful movement throughout the health and medical profession in the United States and around the world. Characteristic or native to a particular region, species, or population. A movement based on the concept of individuals from a wide variety of disciplines to obtain the maximum level of health possible for individuals of all species. A person who assists a veterinarian in working with nonhuman animals. A disease that is endemic to animals. Coston, Bruce R. The Gift of Pets: Stories Only a Vet Could Tell. Thomas Dunne Books New York, 2012. Division on Earth and Life Studies. Workforce Needs in Veterinary Medicine. National Academies Press Washington, DC, 2012. Field, Shelly. Career Opportunities Working with Animals. Ferguson's New York, 2012. Sirois, Margi. Elsevier's Veterinary Assisting Textbook. Elsevier/Mosby St. Louis, 2013. Burns, K. "Task Force Presents Revised Model Practice Act." Journal of the American Veterinary Medical Association 240, 1. (2012): 13-4. Dantas-Torres, F.; B.B. Chomel; D. Otranto. "Ticks and Tick-Borne Diseases: A One Health Perspective." Trends in Parasitology 28, 10. (2012): 437-46. Flatland, B. "Veterinary Laboratory Quality Management—It Takes a Village." Veterinary Clinical Pathology 41, 2. (2012): 171-3. Orand, J.P. "Antimicrobial Resistance and the Standards of the World Organisation for Animal Health." Revue Scientifique et Technique 31, 1. (2012): 335-42. "Animal and Veterinary." Food and Drug Administration. http://www.fda.gov/AnimalVeterinary/default.htm. (accessed October 31, 2012). "Careers in Veterinary Medicine." Association of American Veterinary Medicine Colleges. http://www.aavmc.org/students-applicants-and-advisors/careers-in-veterinary-medicine.aspx. (accessed October 31, 2012). "Preventive Veterinary Medicine." http://www.sciencedirect.com/science/journal/01675877. (accessed October 31, 2012). "Veterinarians." Occupational Outlook Handbook. http://www.bls.gov/ooh/healthcare/veterinarians.htm. (accessed October 31, 2012). American Veterinary Medical Association (AVMA), 1931 North Meacham Rd., Suite 100, Schaumburg, IL USA 60173-4360, (800) 248-2862, Fax: 1 (847) 925-1329, https://www.avma.org/About/WhoWeAre/Pages/contact.aspx, https://www.avma.org/.